Image | Formats | That Yum Factor! If your stomach is growling during lunchtime, I think it is safe to say this will help satiate your hunger throughout the day. This might actually be able to count as your lunch and your dinner entirely. M & P Biancamano’s is a family-owned Italian spot that serves their sandwiches stuffed beyond belief. 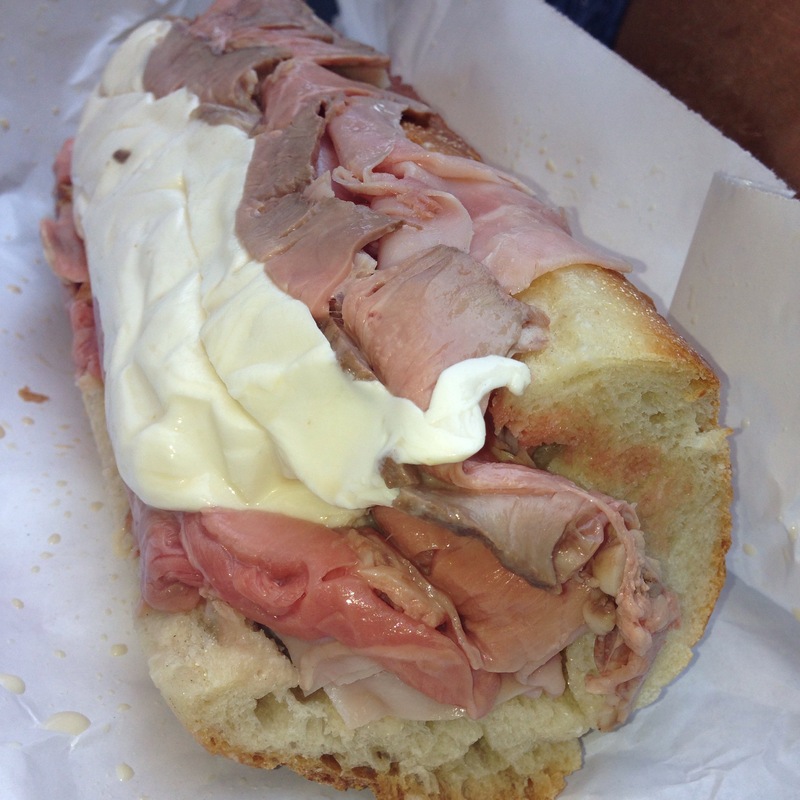 This was the ham, roast beef, and mutz – basically make sure to just get anything with “mutz” on it. For those who are not from the East Coast (or tri-state area to be more specific), “mutz” is short for fresh mozzarella. Hoboken is not only known for baseball and Frank Sinatra but also its fresh mozzarella, so much so that they even have the annual “MUTZFEST.” The one at M&P is so tasty, plus it has actually won the contest before – and rightfully so because their cheese is on point. If you want to try the best, make sure to go to the ‘fest! Posted in Hudson County - NJ, Image format and tagged Biancamano, Hoboken, M&P on September 10, 2015 by thatyumfactor. Every year my family takes a vacation to New England and there is always one place we must stop at, the Sea View Snack Bar in Connecticut. This cute family-owned, counter-serve spot is nestled right on the Mystic River and is a quick stop off of Route 27. You can grab delicious seafood and sit at a picnic table while overlooking the boats and scenery of the beautiful river. There are two items I always need to get from here, the fried clam strip roll and the lobster roll! The clam strips are phenomenal (says Vince Vaughn circa Wedding Crashers.) They are tender, fresh, and I love drowning them in tartar sauce. There is also another must from here, the onion rings. Although they are a backup dancer in this pic, they deserve some credit too. Posted in New London County - CT, Image format and tagged Mystic on July 7, 2015 by thatyumfactor. This is one of my family’s favorite places to go in Little Italy and there is a reason why (pictured above.) This might look like your classic mutz and ricotta calzone, but it is actually fried. Fried calzones are a specialty my grandmother used to make, but this place brings back great memories of that crispy, cheesy deliciousness. I think it is safe to say that anything fried tastes that much better, especially when it comes to dough stuffed with cheese. Let’s just say once you’ve tried the fried… baked will get put to the side. Posted in Manhattan - NY, Image format and tagged Il Piccolo Bufalo, Little Italy, New York City on June 26, 2015 by thatyumfactor. Bareburger first opened up in Queens in 2009, and now has over 18 restaurants. The popularity of their organic and all-natural meat is clearly helping them grow into the big franchise they are today. If you once over my page real quick, you will start to see a pattern – I clearly had a burger craving this summer! But, this one is highlighting a different kind of meat… BISON! Bison has a lot of protein with less fat than beef, plus its super tasty. 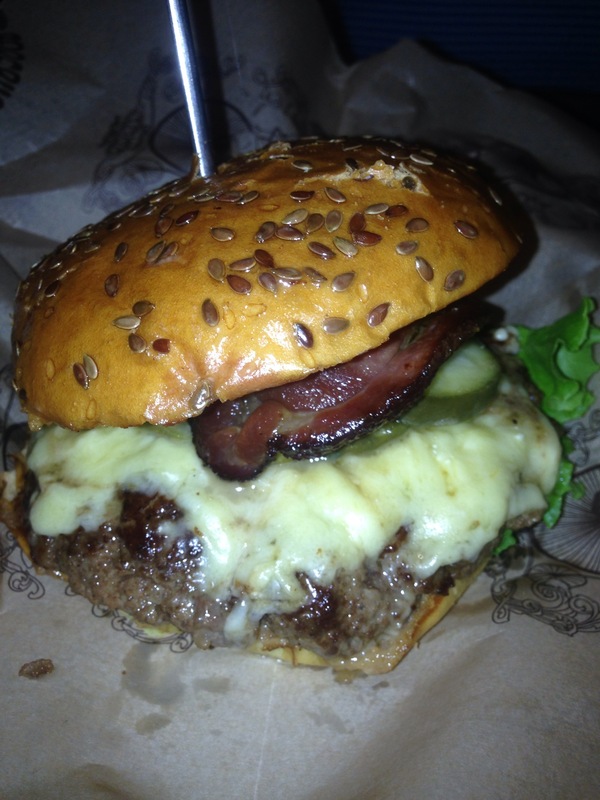 My meal selection above was a “make your own” from Bareburger with aged cheddar, Canadian Bacon, and pickles. However, they have tons of specialty burgers to choose from. I think next time I am going to order the Bison (cooked medium), Gouda, and one of their special sauces. But, can I just jump to the onion rings now? I am slightly obsessed with them. My overall obsessions in life go Dogs, Bravo, Mutz Cheese, Wine, then Onion Rings. Okay… I have different infatuations everyday but whenever there is a choice to go with a side of fries or a side of onion rings, I opt for the latter. Clearly some places have better fries than rings, and I adjust my choices accordingly. At Bareburger, what’s great is that they have so many options. You can get the larger basket order of onion rings plus fries (or sweet fries) that comes with several of their dipping sauces (my faves are the habanero mayo, special sauce, and buttermilk ranch.) 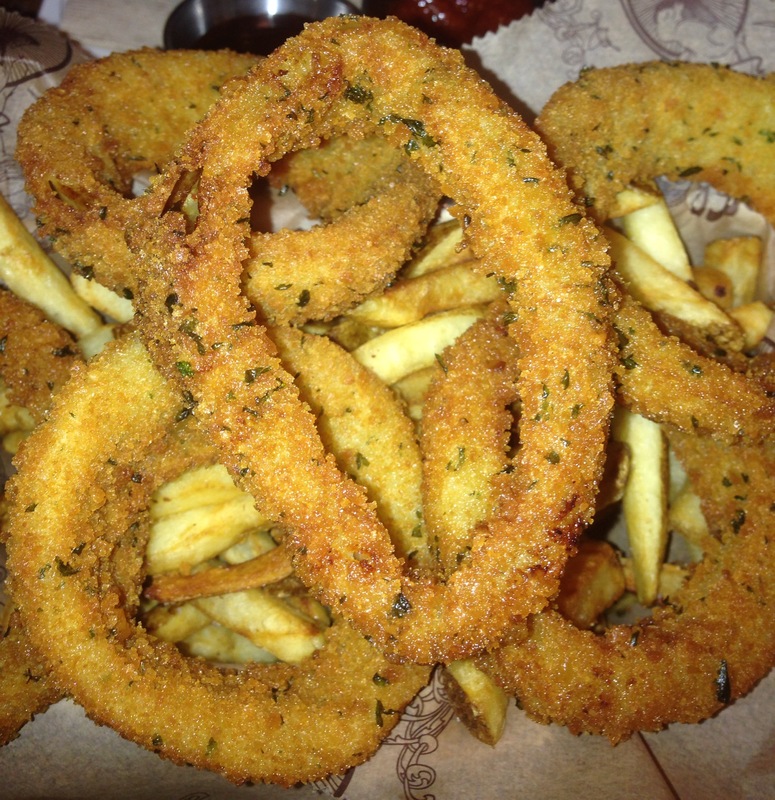 If you and your friend are not too hungry and just want a taste, the side of rings and fries is just as filling. It doesn’t come with the dipping sauces (they cost a bit extra) but you might as well get one or two to try it out. Posted in Hudson County - NJ, Image format and tagged Bareburger, Hoboken on June 25, 2015 by thatyumfactor. Do you love lemon, butter, and white wine? Clearly the answer is yes to all three, but when you combine those ingredients you get a trifecta of taste and it’s called francaise sauce. I am definitely a chicken francaise fan, but there’s something even more delectable. Artichoke francaise! I guess you have to enjoy the taste of artichokes, I personally do in my antipasto. 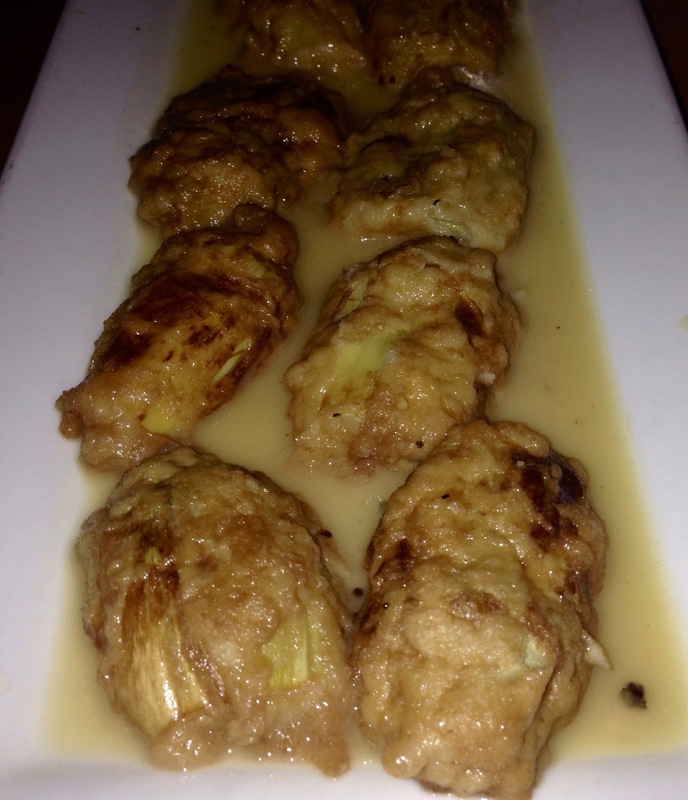 However, I would argue that these are so tasty that it will make you into an artichoke groupie. Each piece of artichoke is lightly battered, fried and doused in the lemon, butter, white wine sauce that I mentioned above. If you love Italian food you will know one of the best parts of a dish like this is being able to dip your bread in the sauce when the meal is complete. It’s like two meals in one. Posted in Monmouth County - NJ, Image format and tagged Brielle on December 3, 2014 by thatyumfactor. This might be a bold statement but I think this is my favorite post yet. If I could give out awards, this one would have won for “Highest Yum Factor” of 2014. I am particularly biased because I love chicken parmigiana and pizza, so when those two get married they make the ultimate power couple. Our eyes want to believe it’s a typical pizza, but don’t let the round shape fool you – there’s an entire layer of chicken nestling beneath a mound of melted cheese, sauce, and crunchy breadcrumbs. Let’s start with Quality Italian in general before I get into the cheesy, scrumptious details. QI is a two-story restaurant in mid-town Manhattan that serves Italian-American cuisine. The decor and atmosphere is intimate, rustic, and so New York. It’s a wonderful place to bring a date for a special occasion or have your food-obsessed family (ahem! like mine) enjoy a delicious meal during the holiday season. I just say holiday season because I am coming back to this same spot to get this same dish with them as soon as possible. I also plan to try out their sister restaurant Quality Meats. This place lives up to its name as every food item is of the highest quality. 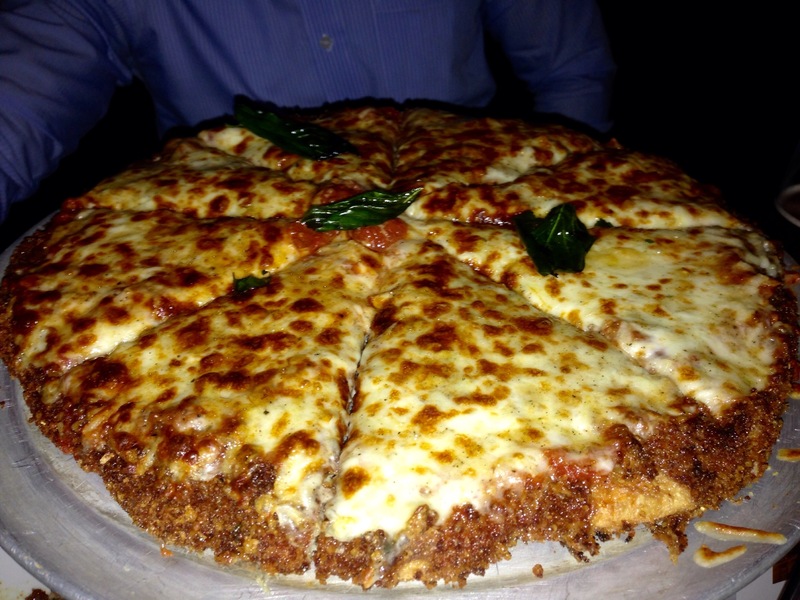 We clearly ordered the “Chicken Parmigiana for Two” that we read about thoroughly (as all of us do) on Yelp. 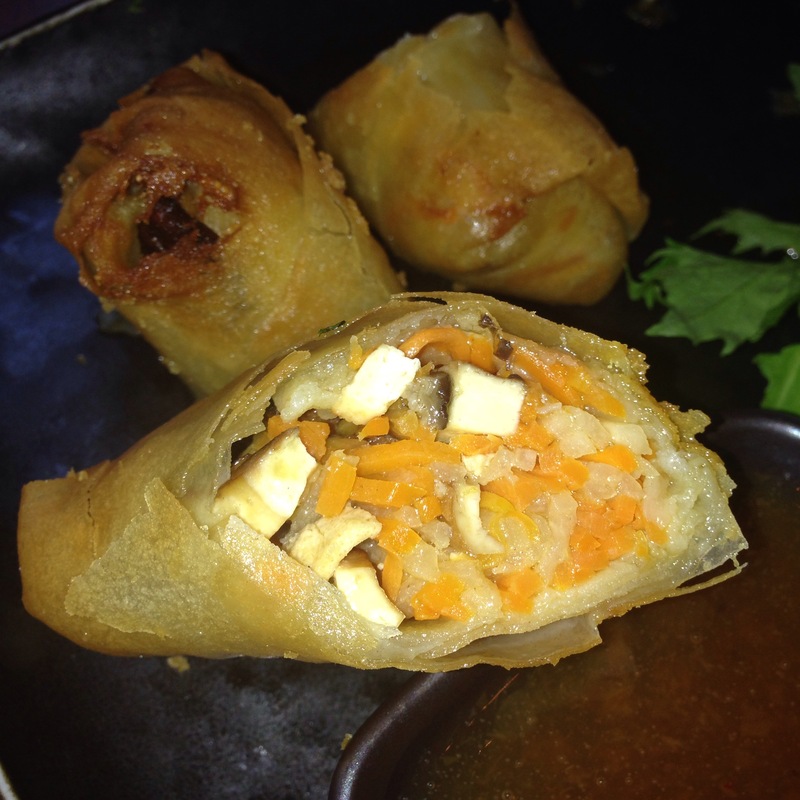 It seemed to be one of their signature dishes that not only appeared to taste good but was just such a dining spectacle that you had to experience it for yourself. It came to our table and the guests around us were asking why we were gushing about it and taking pictures… not with each other… but with our meal. When we explained that it was no ordinary pie, they asked, “well, how does it taste?” The only response we could utter was “AWESOME!” The chicken is juicy, tender, and about one-inch thick. 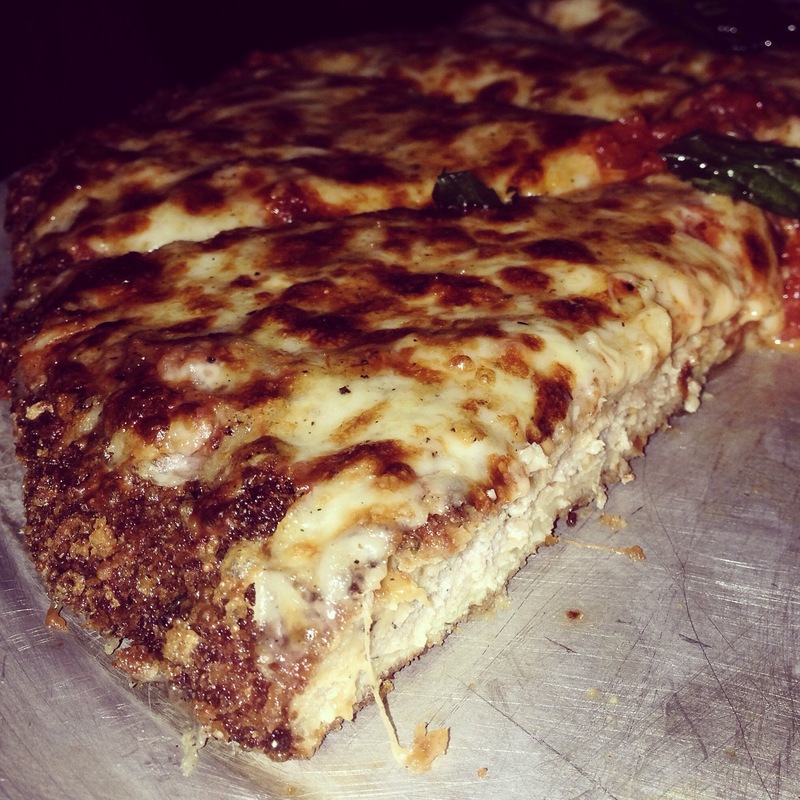 It is surrounded by crunchy, crispy breadcrumbs and melted cheese. The sauce itself was NOT overpowering, which I love about a good chicken parm. I want it to be about the chicken and the natural flavors, and don’t need a heavy sauce to obstruct my enjoyment of the first two. We also tried the side of creamed kale carbonara which was mouthwatering. Even the complimentary bread they give you in the beginning is unbelievable. It’s doughy and has a hint of garlic as it’s (again) not too overpowering. When they give you the olive oil I always sprinkle some salt and pepper in it and then dip that into my bread. With everything we ate, I didn’t feel guilty. I felt that I just genuinely got a wonderful meal made with fresh ingredients, and as we all know, that’s hard to come by these days. Posted in Manhattan - NY, Image format and tagged Midtown West on November 17, 2014 by thatyumfactor.